An investment firm co-owned by Russian billionaire Alisher Usmanov has revealed it has increased its stake in Arsenal football club to 24%. Red and White Holdings previously had about 23% of the club's shares and has been reported to have a goal of owning at least 25%. 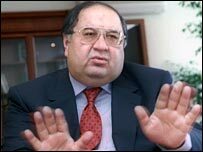 Mr Usmanov is a metals magnate with an estimated $5.5bn fortune. He bought into Arsenal in August last year, paying former vice-chairman David Dein about £75m for his 14.65% holding. Mr Dein is now chairman of the consortium. If the stake was to reach 30%, Red and White would have to launch a formal takeover approach. Late last year, after announcing strong results, the Arsenal board said there was no need for a wealthy individual backer, and insisted that it was not about to sell up. Arsenal director Daniel Fiszman is still the largest stakeholder in Arsenal, with 24.11% of the Gunners' shares.